Hypnagogia is the imagery, sounds and strange bodily feelings that are felt at “sleep onset.” This is a simplification though, as researchers have noted hypnagogic imagery in the lab at periods of quiet wakefulness as well as stage 1 sleep. Others have correlated hypnagogia with pre-sleep alpha waves and also REM intrusion into sleep onset. The truth is that the wake-sleep transition is still not understood. And neither are its trippy visuals. Few people remember hypnagogic imagery. This stage is so slippery, it may only last a few seconds. But its imagery is well-recorded by dream enthusiasts from centuries past: whispy lights, multi-dimentional geometric objects, or a sudden image like a stranger’s face or a teddy bear. Occassional fully-articulated dream scenes do manifest, but they are disconnected, usually a single image or moment, rather than a long narrative plot as we see in REM-style dreaming. Some hear music — I personally have had lucid hypnagogic orchestras from time to time, with the ability to listen passively or focus on a particular instrument to induce a solo. These concerts have included classical music, jazz, and even down-tempo darkwave electronica, each time filling me with awe and joy upon awakening. Lastly, the bodily sensations felt during hypnagogia are just bizarr-o. Feelings include floating, falling, and being separated from your body. Many OBEs occur from sleep onset. Then there’s the hypnic jerk, that sudden awakening right after a full-dream immersion such as walking down the stairs and tripping or driving in a car and hitting the bumper of the car in front of you. Bam! Some people are haunted by the hypnagogic imagery. Rather than lasting only few moments, it goes on and on for long stretches of time. They may open their eyes and still see the dream imagery overlaid –and sometimes — interacting with the physical environment. The most common nightmarish visions are creepy-crawly insects, like roaches crawling upon the walls and on the ceiling, dropping on to the bed. Sometime hypnagogic sufferers sense the “invisible presence” felt in sleep paralysis visions, but overall the mythological and humanoid entities are more rare for non-paralyzed hypnagogia. Many inventors, artists and scientists have reported eureka! moments that came during a quick snooze. In fact, Thomas Edison and Salvador Dali both had methods in which they incubated hypnagogic dreams on purpose, according to Deidre Barrett in the Committee of Sleep. 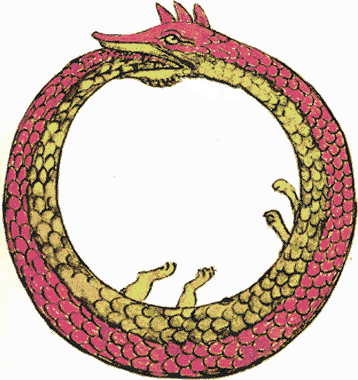 Most famously, chemist August Kekulé came to understand the structure of the benzene molecule after falling asleep in front of the fire, and seeing a classic ouroboros: a series of molecules made out of snakes, with one swallowing another’s tail. The neurological relationship to hypnagogic imagery has been pondered over for decades. One of Freud’s contemporaries, Henry Silberer, a brilliant dream researcher in his own right, thought that hypnagogic imagery is the clearest example of autosymbolism, in which whatever we’re thinking right now is converted into a visual metaphor. Psychologist Harry Hunt noted that the imagery is less like REM dreaming imagery and more closely resembling the stuff seen during meditation, sensory deprivation (the Ganzfeld Effect) and especially the psychedelic ecstasy from LSD or psilocybe. Medical researcher Rick Straussman suggested in DMT: The Spirit Molecule that the pineal gland gives up a precious jewel of endogenous DMT when we enter into a hypnagogic trance that is characterized by predominant THETA brainwaves. 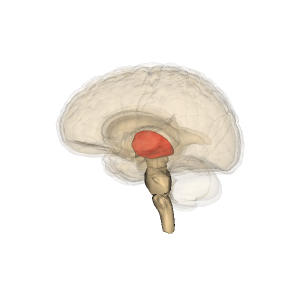 The thalamus, which is ordinarily not this red. Another promising finding comes from a 2010 study published by the Proceedings of the National Academy of Science. Researchers suggest that hypnagogic imagery is not tied to brain activity in the frontal cortex but to the deactivation of different parts of the brain at sleep onset. Neuroscientists have long known that different parts of the brain “go to sleep” at different times, but until recently it was not known that thalamus goes off-line before the cortex, often with several minutes in between. Because of the thalamus’s role in processing visual imagery as well as spatial information, this could explain why we feel awake still when suddenly some bizarre imagery drifts across the visual field. Perhaps without mediation by the thalamus, we are made consciously aware of not only autosymbolic visual imagery, but also bodily and spatial feelings as well. 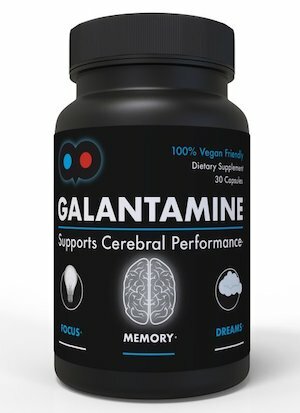 Some readers of this blog have shared how 5-HTP and melatonin can be used to prevent runaway hypnagogia. This is a more gentle approach than the pharmaceutical answer, which includes dream-killing antidepressants. Still, this is an option for those plagued by unwanted hypnagogic hallucinations. On the other hand, hypnagogia can be willfully promoted as a meditative state. I know one meditator who regularly has 20+ minutes of hypnagogia, which she uses for artistic inspiration and spiritual practice. Like lucid dreaming and remembering dreams in general, this takes willpower and patience. Sleeping on your back promotes HH, but be careful, as this can promote sleep paralysis as well. Try taking naps in the afternoon as well, and avoid alcohol or caffeine for a few days to strengthen your sleep architecture.Once mastered, sleep paralysis can lead the way to more hypnagogic adventures. Thalamic deactivation at sleep onset precedes that of the cerebral cortex in humans Proc Natl Acad Sci U S A. 2010 February 23; 107(8): 3829–3833. The Committee of Sleep by Deidre Barrett, PhD. DMT: The Spirit Molecule by Rick Strassman, MD. I experience the hypnic jerk a lot, with some remembered images. Since I’ve got a history of falling asleep in inappropriate places, I have an association of being highly embarrassed by this movement, as it’s the big tip off that you’ve nodded off! I regularly use the hypnogogic state to meditate, its almost lucid–certainly I interact with the the denizens in that dream-place. The sleep paralysis is desired–it means the body is asleep and the mind/soul is able to move more freely through the dream-scape. Thank you for this site–I’m finding that I’m not the only one who finds the dream-place as facinating as the mundane world. Great post, Ryan. I have hypnapompic dreams – usually of orchestral music, spiders, and people, but once I could see colors in front of me and was able to stay in the state long enough to actually use my physical hands to make swirls in the colors. It was pretty cool! Hypnopompic dreams run in my family (no one has ever mentioned having hypnagogic deams, which is interesting to note.) I wonder if there may be a gene or something that can cause certain people to experience more of these sensations than other people. Danielle – yup, I do this too. It’s a problem. Jo – great to have you! Amy – I too wonder about the family genetic component. My mom also has powerful hypnagogic dreams, and there’s a lineage of uncanny dreamers from her side going back at least 4 generations. I’ve experienced hearing my name called and hypnic jerks too. Speaking of jerking about, lately my body has been doing a quick jerk right before I fall asleep. I’ve felt it and even my girlfriend has witnessed it a few times when I’ve fallen asleep next to her on the couch. This blog is like a gift to me. I have experienced some of these things since childhood and have had no idea what they were. I see faces and scenes although not nearly as much now as I used to when I was younger. I am also on an anti-depressant med now. Does that interfere that much with it. Thanks for some clarification. 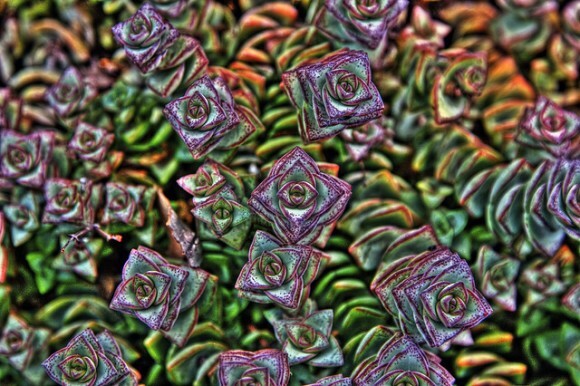 I experience & remember hypnogogic imagery most night, hypnopompic imagery only occasionally. The hypnopompic imagery for me is more like an hallucination, I see images superimposed on waking reality, I mean my eyes are open and I’m fully conscious but seeing things. I’ve had the jerk many times and occasionally a fragment of imagery as I’m drifting off to sleep. It has usually been pleasant or neutral imagery, interesting compared to usual thinking, often lucid and always very brief, just a few seconds or so. When I was a child my my mother and brother told me a few times that I had been sitting up with my eyes open, talking with the even, but still asleep. “You had your eyes open while you were sleeping”. That hasn’t happened as an adult but the imagery when drifting off does from time to time. As a child I always had vivid dreams but when I started taking Inderal as a beta blocker for migraines those dreams became even more vivid, more violent and I have no problem remembering them the next morning. I am a multi-published speculative fiction author and have a very active imagination. I mostly write dark fantasy so the creatures I envision in my work take on nightmarish proportions in the books. Not so in real life. I began having hynopompic hallucinations right after my husband passed away in 2009. The imagery doesn’t frighten me and I know the things I’m seeing aren’t real but they have been a nightly nuisance. I am wide awake and completely aware. Of late, the images have moved closer to my bed. Where before they had been in the bathroom about eight feet away, they are now in the bedroom with me and last night one was right over my head on the wall. To say that was unnerving is putting it mildly. Even knowing what I was seeing wasn’t really there, it unsettled me all the same. I have tried meditative techniques, taken sedatives, drank enough warm milk that I spent most of the night going to the toilet, but nothing at all works. Once the images begin, they increase until I am seeing not just one but a crowd of phantasmal shapes in the room with me. Two nights ago I had the first olfactory hallucinations. It was a very strong wafting of my late husband’s favorite cologne. I’ve had hypnogagic hallucinations since H.S., about ten years ago. It occurs every few months, at times more frequently. It’s an uncanny experience. It lasts for about 20-30 seconds. It starts with an intense sensation, hard to explain, almost like a humming inside my head, but it’s not painful or euphoric, it’s just unique to that experience. The sensation can be amplified if I’m aware I’m falling into a hypnogagic state, although I don’t apply full force because a part of me is afraid of falling into a coma, even thought there’s no basis for this fear. There’s also a feeling of ascension, like being on the astral plane, as if my body is being pulled away from my bed. It’s quite fun. Once the sensations is gone, there is a fading effect, the second half to my hallucination begins. The sensation is gone, but still images usually remain or emerge, slowly dissipating. The first half I’m completely paralyzed, and sometimes unaware of being in that state, unless I’m aware from the beginning, but I’m always aware once the second half takes place. I can choose when to pull myself out of the hallucination during this half. The longer I wait the easier it is to wake myself, and I’m completely aware of the state I’m in, even when I don’t start the hallucination with awareness. It’s a remarkable experience. I even learned to induce the phenomenon, which isn’t easy, but I stopped because I thought I was producing a self induced seizure. Now I let it happen on it’s own. Although I haven’t produced anything creative from my hallucination, I do believe it induces creativity. I can vividly daydream for hours, it helps if want to write screenplays. I like to write about my experience for a local community publication, can someone tell me if I sound coherent, I’m not the best technical writer. One last thing, I loved reading everyone’s comments, wish I came to the party earlier. Charlee, like you I am fully awake in bed when I see my hallucinations, but unlike you I am believe that they are real, no matter how hard my poor wife tries to convince me otherwise. In spite of the fact that I have had countless episodes like this, I am fooled every time, as though forgetting that I have this condition is part of the condition. Sajjad. I am a screenwriter too. I often wonder if living in an imaginary space for so many hours a day contributes to this stuff. Certainly the irregular sleep that deadlines induce brings it on a lot more. thanks everyone for sharing their experiences! I have experienced hypnagogia in an extreme way my entire life.. as a creative person… musician/artist/graphic designer/game designer/ I find hypnagogia so incredibly helpful.. I only recently discovered what this state was… as in giving it a name.. I still have a hard time either remembering what great realizations/symbols/ideas I have in this state but have been trying recently even before discovering its name to find a method to actually record and remember my ideas in this state..since i have a hard time actually getting myself to snap out of the state and then write stuff down.. I have heard amazing musical pieces.. come to great realizations.. come up with some of my best ideas for stories / art etc… in this state.. and hypnagogia always seems to compile and sort my creative ideas that seem like they are going no where in my waking life.. I was also an opiate addict for many years and not to condone usage of opiates but.. it seems as if opiates can increase the length and severity of hypnagogia.. I still take suboxone and find it also may in fact also cause or increase the severity and length of hypnagogia.. I hate my hypnagogia. I only really began to notice it in the last two years or so, and it’s terrifying. I don’t see shapes or feel a presence or hear music … I have what I have begun calling mini-nightmares. They’re intense, they have plots, and, if I’m foolish enough to try going back to sleep, they come in ever-escalating waves of terror. It’s gotten to the point that when it happens, as it has tonight, I don’t even try to go back to sleep when I wake from the first one, because I know the next one will come, then the next, and then … etc. Tonight’s episode sent me to the computer to consult the google. I ended up on your blog. I remember all of them in startling detail. All of them. I’m a published author, so I suppose my creative mind is the culprit, but I wish, beyond anything, that I could stop this from happening to me. Deneane, check out the following post’s comments, where readers discuss how they cope with unwanted HH. there’s some ancedotal evidence for melatonin as well, which is a safe over the counter supplement. Thank you for this great site and all the info it contains. I am so pleased that I came across it while on a search for ‘Shamanic Dreaming’. The stories here reflect my own night time experiences. The jerking just before sleep, the HH, being able to smell touch and taste in dreams. The way dreams would inspire my work when I was a Fashion Designer in the 70’s, I was convinced that there is so much more to the mind when we sleep. One thing I have not seen mentioned is a Dream Town or City. Since a child I have visited the same area when I dream. It started out as a village and has grown over the years into a city with its own areas as any real city would. I meet my dream friends in their homes, or the dream cafe. I will walk, drive or float to the ghetto area or to where new souls land after dying. People who die in real life meet me and talk about things they did while alive. Some are chnged in attitude, but many stay the same. Some ‘move on’ quickly while others stay for years. I could write pages, but this is not the place. So thank you again and I will visit often. I have tried to explain it as sudden sleep or quick dreaming, but to no avail. My friends have always enjoyed it, truly. They enjoy talking to me during it. I talk into Hypnagogia and through it. I can’t tell you all the things that I talk about, but they always wake me up with their laughter. Does anyone else talk about what is going on while it happens? I am often told that I’m “just makin’ crap up”, but I never know what they’re talking about when this happens. It’s truly begun scaring me as of late. I’m 34 and it seems to be getting worse. Especially if/when I have alcohol in my system – lol. Anyway, I am very glad to have found this site. Thanks for sharing! I have hypnagogic experiences only while reading. I will feel tired then see colorful & wild images and hear loud sounds, words, and noises. I think they only last a moment or two. These “wake me up” and if I continue to read I will have more such experiences. I have never had these while falling asleep or waking — only while reading. very cool Marie! you seem blessed to be conscious while in the transition to sleep, which is very ephemeral. I wish could do this! for many years, maybe 20, and i’m 61, i have textures appear when i am waking up or going to sleep, and most often they are wood. just different types. i have seen (about 6 inches from my face, and they last 10 seconds or less) also, metal, wallpapers, skin, all colors of wood, and the first one was oil cloth, bright yellow. my eyes are closed, but i am awake. i used to hear sounds sometimes also, all types, ring, chime, doorbell, phone, tinklebell, and now when they come, not very often, i cannot tell what they are. but on the sounds, they were always different. on the seeing of textures, they are mostly always wood. i always say, thank you, i love you too (thinking it’s a gift) but i would really like to know how to use these things…maybe to get to another dimension. that hasn’t happened. and i’ve only had one or two lucid dreams. i feel comforted when they come, however. any ideas how these can be useful? I’m interested in the way my mind focuses on what might be described as locus of control when I’m having hypnagogic hallucinations. Mine are relaxing and peaceful, with what you might call psychedelic colors–brilliant blues, pruples, fuscias, greens, oranges–shfting and transforming in amorphic shapes. Sometimes they drop from above as though affected by gravity, other times they seem to be pulled into different shapes as though by a magnet. The patterns and their movements seem to be attached to some sort of significance which I haven’t grasped. This feeling of not knowing what they mean which opens in turn into a limitless portal of possibility, like listening to a droning chant of nonsense syllables or viewing the alphabet of an unknown language can sometimes do. My mind attempts to discover their meaning while I simultaneously find myself pondering from where they are originating. Often, I feel that I am able to manipulate them with conscious intention, and I can demonstrate that to myself; yet when I relax, I feel they belong to my subconscious and let them take shape without interfering (and soon after I do that, I’m asleep). I think of those as two possible loci; conscious, and subconscious. They seem to be self-fulfilling; if I think I’m in charge, I am. If I think I’m not, I am not. And above that, I find myself able to identify that there is a “me” that attributes an origin to them, which is an empowering experience. I recognize that sometimes I study them as figure and ground and flip them so that foreground becomes background, etc. This is also an experience of empowerment and I use it as a practice of perception. I regularly meditate and sometimes also have this experience while in silent meditation. The meditation is a practice of bringing up and examining that which is within rather than opening myself to all. 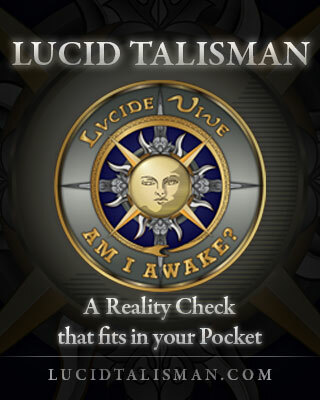 I’m a lucid dreamer and I am a “bad” sleeper. The hypnagogic hallucinations are stronger sometimes than others. I guess they last about twenty minutes, although it’s difficult to time them. I generally wake up about 3 am and don’t get back to sleep for several hours, so I’m a little overtired during the day and often take naps. The hallucinations come with the naps, too. This is a fascinating study, Ryan! I hope we can all learn from your efforts here. Thank you for this and all your wonderful work Ryan, so helpfu! What brings me here today is a search to understand recent developments in the hypnopompic state, that I’ve never had and cannot find any answers for via Aunt Google. As I awaken – a distinct sense of arrival, usually – and I remain still with eyes closed to recall dreams, incredibly vivid, clear imagery appears, sharp and crystalline; it completes a motion or reaches a crescendo and then disappears. Most often it is a point of light, pure brilliance, but has also been coloured 3D shapes and even objects or music notation. Has this been observed elsewhere and where may I learn more? As for hypnagogia, I miss that! It’s rare these days as I fall asleep too quickly. In fact it seems the borders between sleeping and waking have become far more distinct and sharp than I’d like, instead of the preferred dreamy segue. Any suggestions there?